The national bestselling author of A Churn for the Worse returns to the Amish community of Heavenly, Pennsylvania, where shop owner Claire Weatherly must unravel the perplexing ties between a lost piece of jewelry and the disappearance of a cherished author. When a mysterious rattling sound confounds the guests at Heavenly’s local inn, Detective Jakob Fisher steps in and cleverly deduces the noise’s source. But the necklace he discovers sparks an even larger mystery when Claire realizes it’s connected to the writing of a popular author who’s vanished and left her fans clamoring for a new book. Determined to track down the necklace’s owner, Claire vows to follow the clues wherever they lead—even if it means finding someone who might not want to be found . 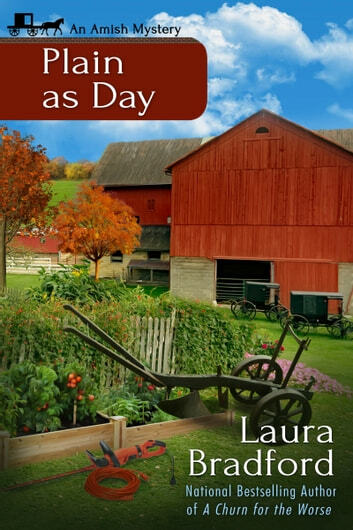 . .
Laura Bradford is the national bestselling author of the Amish Mysteries, the Jenkins & Burns Mysteries, the Emergency Dessert Squad Mysteries, the Tobi Tobias Mysteries, and the Southern Sewing Circle Mysteries (written as Elizabeth Lynn Casey). Portrait of a Sister, her new women’s fiction novel, will be available in June. Laura is a former Agatha nominee and the recipient of an RT Reviewer’s Choice Award in romance. In her free time, Laura enjoys making memories with her family, baking, and being an advocate for those living with multiple sclerosis. For more information and all the latest book news, visit her website at www.laurabradford.com. A lost necklace...Can Claire find the owner? 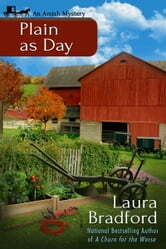 This short novella, part of the Amish Mystery series, contains a mystery for Claire to solve, but this time it is neither a crime nor a murder. Instead, the mystery, finding the owner of a lost necklace, provides Claire with an opportunity to examine her own path since moving to Heavenly, Pennsylvania, a town that embraces both Amish and English cultures. As she works through the clues, in addition to getting ready for Esther's baby shower and managing her store with the help of her assistant, she recognizes the importance of the life change she made, a change that has brought her to the caring aunt who stands with her in times of adversity, to he feeling of stability and friendship with her friends, as well as to a new love in Jacob, a man who sees her soul and loves her for herself. I look forward to the next book in this series.